In medium bowl, mix 2 cups flour and 1 teaspoon salt. Cut in shortening, using pastry blender (or pulling 2 table knives through ingredients in opposite directions), until particles are size of small peas. Sprinkle with cold water, 1 tablespoon at a time, tossing with fork until all flour is moistened and pastry almost cleans side of bowl (1 to 2 teaspoons more water can be added if necessary). Gather pastry into a ball. Divide in half; shape into 2 flattened rounds on lightly floured surface. Wrap in plastic wrap; refrigerate about 45 minutes or until dough is firm and cold, yet pliable. This allows the shortening to become slightly firm, which helps make the baked pastry more flaky. If refrigerated longer, let pastry soften slightly before rolling. Heat oven to 425°F. With floured rolling pin, roll one pastry round into round 2 inches larger than upside-down 9-inch glass pie plate. Fold pastry into fourths; place in pie plate. Unfold and ease into plate, pressing firmly against bottom and side. In large bowl, mix sugar, 1/4 cup flour, cinnamon, nutmeg and 1/8 teaspoon salt. Stir in apples. Spoon into pastry-lined pie plate. Dot with butter. Trim overhanging edge of pastry 1/2 inch from rim of plate. Roll other round of pastry. Fold into fourths and cut slits so steam can escape. Unfold top pastry over filling; trim overhanging edge 1 inch from rim of plate. Fold and roll top edge under lower edge, pressing on rim to seal; flute as desired. Cover edge with 3-inch strip of aluminum foil to prevent excessive browning. Remove foil during last 15 minutes of baking. Bake 40 to 50 minutes or until crust is brown and juice begins to bubble through slits in crust. Serve warm if desired. If you make pie pastry from scratch, you’ve got choices for the fat—shortening, lard, or butter. The pure fat of shortening or lard gives you some leeway as you handle them in a dough, as they stay hard longer when working them with warm hands. But butter offers a flavor boost you can’t beat, plus the fact that the water in it is released as steam as it melts, helping create a flakier crust. For a nice defined crimped crust, lay the top pastry over the apple filling and press it firmly against the overhang of the bottom crust. Fold the pastry together and over to build up an even ridge of dough. Use the handle of a wooden spoon to mark evenly spaced sections to twist with your fingers into a decorative edge. Have a foil collar or aluminum pastry shields at the ready to prevent over-browning around the top edges of the pastry. You don’t want to under bake the pie or you may have a gummy bottom crust. For a glazy top crust, brush it with some milk or cream and sprinkle on some sparkly sugar, before sliding it into the oven. Cut some slits into the top crust or use small cookie cutters to create vents to release steam. Jump-start your pie baking by using Betty Crocker pie crust mix. Just add water and stir; the dough is ready in 5 minutes. Lay a sheet of foil under pie pan or on floor of oven in case of boil overs. While you know the warm, flaky crust and sweet, juicy filling in this apple pie recipe will be foolproof (thanks, Betty! ), you may encounter a dilemma deciding which apple to use for your filling. 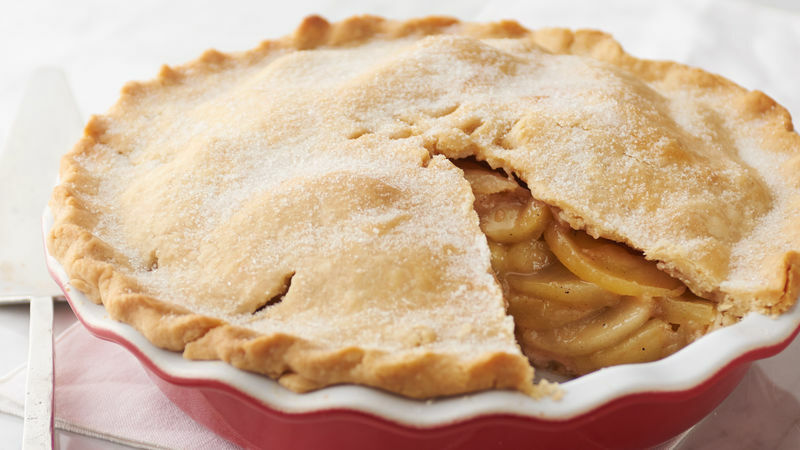 It’s hard to go wrong with any of these favorite pie-baking varieties for homemade apple pie: Braeburn, Bramley, Gala, Cortland, Empire, Granny Smith, McIntosh and Northern Spy. Seek out locally grown varieties and regional favorites to give your pie a unique “hometown” quality. If you’re new to the wonderful world of apple pie baking, check out this essential step-by-step guide, which covers the equipment you’ll need, techniques, tips and photos of every step along the way. If you’re ready to make an apple pie recipe that’s your own unique version, explore Betty's best apple pie collection.